Lilian Knowles House is available exclusively to postgraduates at The London School of Economics. This accommodation offers a fantastic central location just five minutes' walk from zone 1 Liverpool Street Station, and within walking distance of the famous and newly renovated Spitalfields Market. Lower ground rooms are situated below street level and have a restricted view. This is reflected in the prices being charged for those rooms. All students staying at Lilian Knowles House are required to pay an LSE Social Fund fee of £45.00. This is a non-refundable fee and is listed on your account separately to your rent instalment. Please access your account from 17 September to make the online payment of £45.00. In addition to the booking fee, you must pay the first instalment of your accommodation fee in September. Once your offer has been accepted, you can pay your accommodation fees at any time by logging into your account on our website. The accommodation fees are split into one or three equal instalments from the start of the academic year. If you move in later in the year the number of instalments will be reduced. All students staying at Lilian Knowles House are required to pay an LSE Social Fund fee of £45.00. The Social Fund Fee is used by the Social Committee to fund activities and events across the site. The fee must be paid on the date of your first rent instalment. You can pay the fee online under the My Transaction section of the booking system, in person at reception or by calling us on 0300 123 5050. 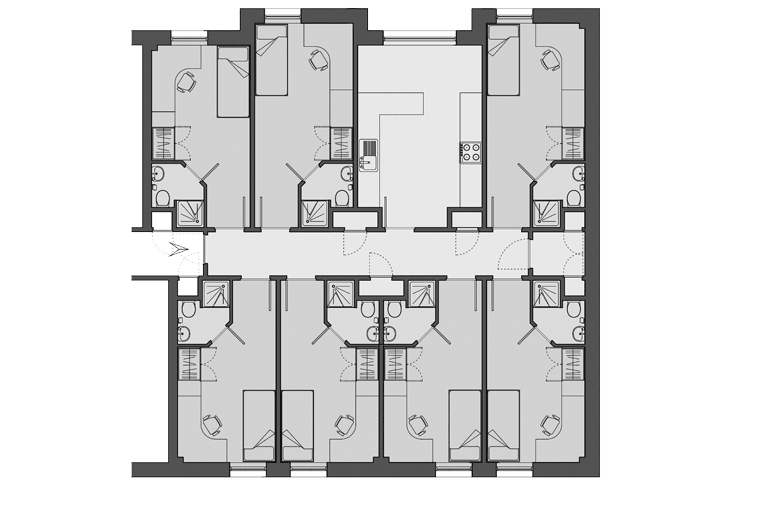 A spacious flat with an open plan kitchen and living area, separate double bedroom and bathroom with a shower. For individuals looking for a larger living space. For your safety and security Lilian Knowles House has secure electronic entry, 24 hour staff cover and CCTV. We offer all inclusive bills as well as free contents insurance, making your budget go further in the capital. Lilian Knowles House also has a guest room available for overnight stays, which is perfect if you've got family or friends visiting. This city centre accommodation has a garden courtyard which provides a relaxing green space in the summer. Other great features include a common room with TV and free Wi-Fi, a computer room, vending machines, on-site laundry and bike storage. Lilian Knowles House provides a perfect base for students that want the excitement of city centre living and peace of mind, knowing that their accommodation has everything covered. Lilian Knowles House is in a great city centre location just 5 minutes' walk from zone 1 Liverpool Street Station, with underground and National Rail services. It's also within walking distance of the famous and newly renovated Spitalfields Market, where you can find a great range of vintage-style clothing as well as a large number of stylish shops and restaurants. The iconic London Bridge is just a 20 minute walk away, as is Canary Wharf and Bank Underground Station. Other local points of interest include the Bishopsgate Institute just three minutes away and the Bank of England museum, 15 minutes away. 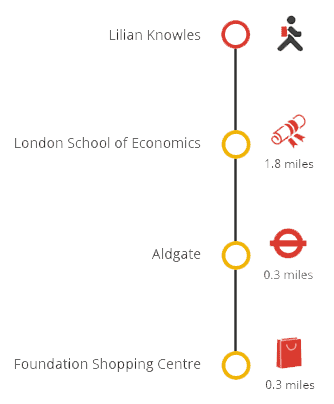 LSE is just 20 minutes away by public transport, making Lilian Knowles House the ideal location for studying and enjoying all that the city has to offer. Sanctuary Students own and manage Lillian Knowles for London School of Economics (LSE) students. The University decides who is eligible for an offer of accommodation at one of our residences. We receive their first nominations in March and send offers at that time. You will then need to accept the offer. Students applying to live at Lilian Knowles House must contact their university to find a suitable replacement. Please see our Sample License Agreement (PDF 150KB) for more details on refunds and how to end your license once you have moved in. The Sample Licence to Occupy (PDF 150KB) is available to download with details of the terms and conditions of your contract with us. From September 2016, you’ll need a TV licence to watch the BBC iPlayer. If you wish to bring a car to London you will need to apply for a residents' parking permit through Tower Hamlets Borough Council and park on the streets surrounding Lilian Knowles House.